This is the final project for Another Girl’s Treasure and I’m excited to share my new Gift Tag Door Hanger made from a thrift store find! I bought these wall hangings at the thrift store for just a few dollars. I really liked the shape of them. They reminded me of oversized gift tags and I thought they would make a cute door hanger! I started by removing the wooden pieces and sanding the surface to smooth it as much as possible. Next, I painted the pieces with a pretty blue paint. I knew I wanted the words to be blue but since I only had white vinyl, I first painted it blue and then added my words with the vinyl and painted over that with white. I also drilled a hole in the top to add ribbon for hanging. Once the white paint was dry, I pulled off the white vinyl to see my letters in blue. I hope you’ve enjoyed this series as much as I have! If you missed any of the projects, you can follow the links below! Welcome to Welcome Home Wednesdays number 72! It’s the last party of 2016…let’s make it a good one! This post was originally posted on Sweet Tea & Saving Grace. Yes, Christmas is over but there is still some fun to be had before the year ends! It’s time to start thinking about New Year’s Eve! How do you plan to ring in the new year? These New Years Eve confetti poppers are the perfect touch for midnight celebrations! Cut a piece of scrapbook paper to the size needed to wrap around the push pop. Mine measured x but you can just eyeball it. Secure the paper with a piece of invisible tape. There are so many ways to decorate your confetti poppers. I like the sparkly paper but you could also use New Years stickers or a gold Sharpie marker. If you want to get really fancy, you can spray paint the popper in gold before you begin! If you like the labels I created, you can click the image below to download. Once you have your push pops all decorated, fill them at least 1/2 way with confetti. Top it off with the metallic shreds. When the clock strikes midnight and you are ready to party, just take the tops off and push up hard on the bottom! So fun, right? I know my kids will love these easy confetti poppers! Looking for more New Years inspiration? I hope everyone has an AMAZING new year! Merry Christmas and Welcome to Welcome Home Wednesdays number 71! You can tell that we have Santa and Rudolph on our minds with the features this week! I hope Santa and Rudolph pay you a visit and that you make lots of memories with those you love!! 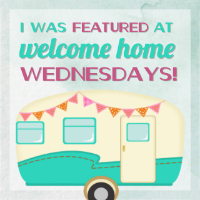 Welcome to Welcome Home Wednesdays number 70! If you are not already in the Christmas spirit, you will be after this party! We have some great festive features for you today! Keep it coming…just 11 more days until Christmas! I’ve never really been one to make New Years resolutions, but I do take time each Jan 1st to write down my prayers for the New Year. This year I’ve decided to get my family involved in this New Years tradition! I wanted a place that we could all record our prayers and be able to look back on them at the end of the year. So, I made this Prayers & Praises ornament! Here’s how I made mine, but if you don’t have these supplies, don’t let that stop you. The important thing is the idea behind the ornament and not how it looks! I stated with a clear glass ornament. You can find these at any craft store. There are also plastic ones that would work just fine. To add the words I used my Cricut but you could also use stickers or a paint pen. I had some gold and black confetti from another project and I thought it would add a fun touch to this New Year’s ornament. I added some black ribbon for hanging. The last step is to add your prayers. Each person can write down their prayers for the New Year and place it inside the ornament. Next year when you pull out the ornaments, you can read the prayers and add your praises! I think it’s important to remember all that God provides throughout the year and what He brings us through. I’m not saying that the answer to each prayer will be Yes, but I do know that God hears each prayer and regardless of His answer, He is always worthy to be praised! When the New Year rolls around, just start all over again. Eventually you’ll have a collection of Prayers & Praises keepsake ornaments! Prayers & Praises for 2017 printable! Does your family have a New Years tradition? Leave a comment below…I would love to hear about it! Welcome to Welcome Home Wednesdays number 69! Christmas is in full swing and I am loving all of your amazing posts…keep ’em coming! Do you love the gorgeous giant wall clocks that have become so popular? I have been dreaming of having one hanging in my dining room for so long! I was recently offered the chance to try the new Pallet Wall in a Box from Amy Howard and I could not say yes fast enough! First of all, I adore Amy Howard and after trying her products at Haven, I knew I could make something AMAZING! * I received the products used in this post from Amy Howard at Home in exchange for a review, but all opinions are 100% my own. The Pallet Wall in a Box is exactly what it sounds like. It’s a box of pallet wood that can be used to create a feature pallet wall (which I totally plan to do one day soon) or anything else your imagination can think up. The box comes with 20 square feet of unfinished red oak. 1. Placing your boards as shown below will give you the largest size possible. 7 large boards with a smaller board on top and bottom. 2. Create a makeshift compass by placing a nail in the center and attaching a string that is the length of the radius of the circle. Attach a pencil to the other end of the string and draw a circle. Make sure to keep your pencil straight. 3. Cut along your lines with a jigswaw. 4. You should now have the circle shape of your clock. 5. To join the boards use a separate piece of wood (thickness between 3/4 in to 1 in- you will not want the clock to be flush with the wall because you will need space for the clock movement). Attach the wood to the back of the clock with wood glue. 6. Once you add the back boards with wood glue allow it to dry before flipping the clock over. 7. Now the fun part! Better with Age is one of my favorite tools for giving wood an aged look. It’s so simple to use! Shake the can and then brush it on. It has the consistency of water so it goes on easily and it doesn’t have a harsh smell like stain. Within seconds you will see huge difference in the look of the wood! Better with Age reacts with the tannins in the wood so each piece and type of wood will have a different final look. 8. Next, you will want to mix the Venetian Plaster with water until you get all of the lumps out. The consistency will be sort of like pancake batter. Brush a thick layer onto your board and remove with a trowel. This will settle the plaster into the cracks of the wood. 9. Leave the wood to dry for a few hours and the plaster will continue to change the look of the wood as it dries. People will think you spent hours sanding but there is zero distressing involved! 10. Finally, add the movement and paint the numbers on the clock. You can do this with a stencil or by printing them and tracing with carbon paper. I used Amy Howard’s One Step Paint in Graphite. I absolutely love my new giant wall clock! Do you think you will try the new Pallet Wall in a Box? If so, I would love to hear what you will make. Comment below and let me know! Welcome to Welcome Home Wednesdays number 68! I love finding easy ways to make pillows and these canvas tote pillows could not be easier! Each year my office gives us our Christmas gift in a canvas tote and of course I saved them because that’s what I do! I decided to finally make use of them. These tote bags are already in the shape of a pillow and have only one open side so you can have finished pillows in a just a few minutes! If your tote bag is the right size you can use a pillow form. You can also use fiberfill if you don’t have a pillow form that will work. You will have to tuck in the straps or cut them off if possible. Once you’ve stuffed the bag, just sew up the open edge or use an adhesive. I used Heat n Bond strips to finish the pillow but you could also use fabric glue. These are seriously the easiest pillows I’ve ever made! If you have lots of these totes lying around and don’t need them, turn them into pillows! I’ll see you back here next month for the last edition of Another Girl’s Treasure for 2016!